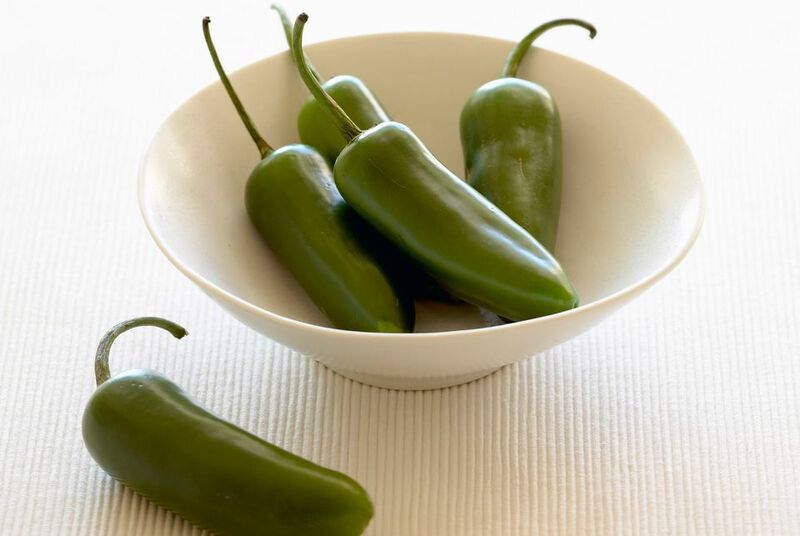 Jalapeño peppers (pronounced "holl-a-PAY-nyo") are medium-sized chili peppers with a mild to moderate amount of heat. One of the most common chili peppers, jalapeños are green when picked and are usually used while green. Jalapeños will turn red as they ripen, both on the plant and after they've been picked. They can be eaten when red, too. They're no hotter when red, but their flavor is somewhat fruitier and less grassy. Like most hot peppers, jalapeños vary in heat based on all kinds of factors, including the amount of sunlight, the pH level of the soil in which they grew, and others. Jalapeño peppers register between 2,500 and 8,000 Scoville heat units on the Scoville Scale. Because they are relatively mild, Jalapeño peppers can be eaten whole. Jalapeños stuffed with cheese, breaded and deep-fried are a popular appetizer. Jalapeños can also be pickled and served as a condiment. In addition, jalapeños are widely used in making salsas, sauces, and bottled hot sauces. Jalapeño peppers can be dried and smoked, in which case they are called chipotles. Chipotle chiles can be ground and used as a spice.